AHMEDABAD: In a major boost to air connectivity out of Gujarat, Airports Authority of India (AAI) signed a memorandum of understanding (MoU) with the state government, for the construction of airports at Dholera Special Investment Region (SIR). 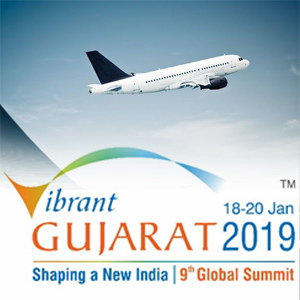 The MoU was signed on the second day of Vibrant Gujarat Global Summit (VGGS) 2019, as part of which two greenfield airports will come up in the state. According to state government officials, the airport at Dholera SIR will be constructed at the cost of Rs 1,500 crore, which is likely to be operational by 2020. "I am pleased to announce that by 2022, a new international airport will be operational at Dholera SIR. Another MoU inked between AAI and the state government also proposed the construction and development of airport and maintenance, repair and overhaul (MRO) unit at Ankleshwar over an area of 92 hectares.t commitment made by Torrent group chairman Sudhir Mehta at the inaugural session of Vibrant Gujarat Summit, said a senior official.